"We’re just booked solid for the next couple of years," says Remedy. 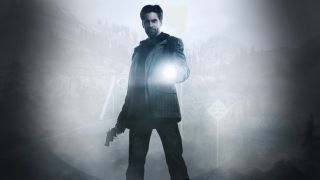 Alan Wake, released almost nine years ago, is exactly the sort of game you'd expect to get a sequel, and with developer Remedy showing off its latest game, Control, it's time once again to ponder the future of the paused series. I wouldn't hold your breath. If you cast your mind back to 2015, you might recall that Sam Lake, Remedy co-founder and writer, mentioned an Alan Wake 2 pitch that the studio had made to Microsoft, getting as far as putting together a "mood piece" video. Unfortunately, it didn't go further, and the studio's discussions around the sequel transformed into the time-bending TV show-game hybrid, Quantum Break. At the time, Lake was still hopeful about a sequel. "I would love to do that... it feels that time has only refined the ideas of what the sequel would be, which is great. It's almost, in some ways and on some level, that all of this extra time to think it about it has made it tastier and more exciting. Only time will tell." Three years on and it looks like Alan Wake fans still have more years of waiting ahead of them. At PAX East, Remedy quickly dashed any hopes of Alan Wake announcements for at least a couple of years. A TV show was announced last year, however, so there are still some things happening in the Alan Wake universe. Lake's executive producer, with Legion and Cloak and Dagger's Peter Calloway serving as showrunner. While TV and film adaptation of games are typically awful, Alan Wake at least seems like a good fit on paper, already mimicking the format of an episodic mystery. At least Remedy still owns the IP, so it won't languish with a publisher that's not really invested in it. Maybe we will see a sequel one of these days, but not anytime in the near future.